Keeping track of your health is now easier than ever, thanks to digital health tools. There are many easy online health tests that you can take advantage of without ever leaving your home. 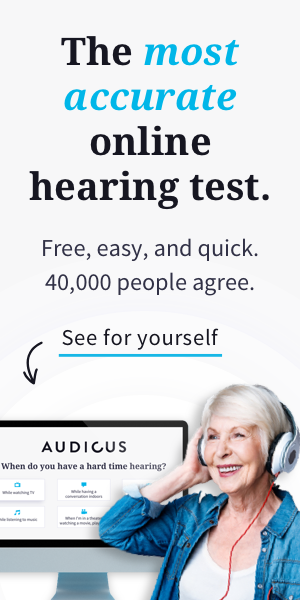 Audicus debuted our own Online Hearing Test, but this is only 1 of many innovative digital health assessments to improve access to healthcare. We’ve compiled a list of 10 digital health tests that you can use to stay on top of your health. You are the best advocate for your own health, so it’s essential that you’re aware of how your body is doing. These digital health tests can help you do just that! These tests should be used as initial indicators of a problem, not diagnostic. Use these digital health tools to determine if you need to seek further medical help from medical professionals. Vision: Essilor’s 7 tests help you determine how healthy your vision is. Do you have 20/20 vision? Take the tests to find out. Color blindness: Did you know that approximately 8% of men are color blind? Color blindness is not a debilitating disability but it definitely affects the way you perceive the world. Test your eyes here to see if you have any form of color blindness. Brain age: Designed by Philips, this is a digital health test to assess your cognitive abilities and how well your brain is functioning. Memory and reflexes are important things to check as we get older. Depression: Mental health is just as important as physical well-being. Take this 3-minute self-assessment to see if you could possibly be suffering from depression. Alzheimer’s/dementia: The SAGE test was developed by researchers from Wexner Medical Center at Ohio State University. Catching signs of cognitive impairment early is important, as treatment is more effective when it’s implemented early. Heart disease: The Mayo Clinic has devised an easy-to-use calculator that assesses your risk for heart disease. Breast cancer: Using family history and personal information, the Cleveland Clinic has a 10-question quiz that assesses the risk of developing breast cancer. Celiac disease: If you think you might have a gluten intolerance or full-blown Celiac disease, this test from Coeliac Australia can let you know if you need further diagnostic testing. Hearing: Our very own online hearing test is easy to use and can alert you in just a few minutes if you might be hard of hearing and require hearing aids. Osteoporosis: Take this quick online assessment to determine the status of your bone health.